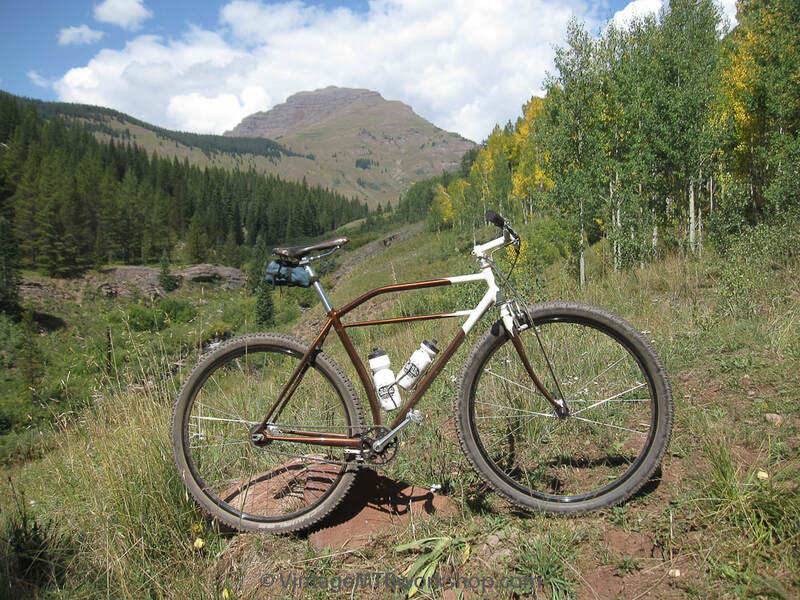 The 41st annual Pearl Pass Tour, a historic off-road route from Crested Butte to Aspen covering 39 miles, was held on September 9th and 10th, 2017. 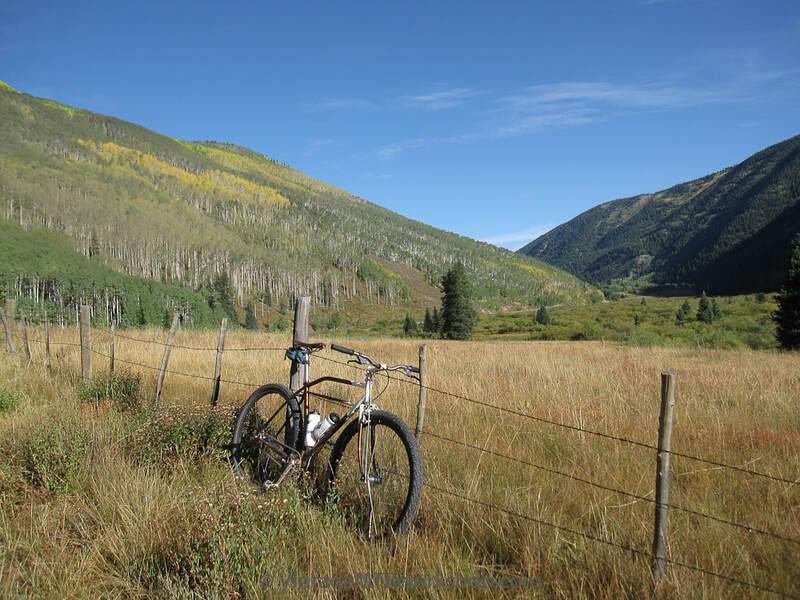 As has been the case in recent times, the weather was perfect, with warm days and cool nights, and a hint of fall colors. 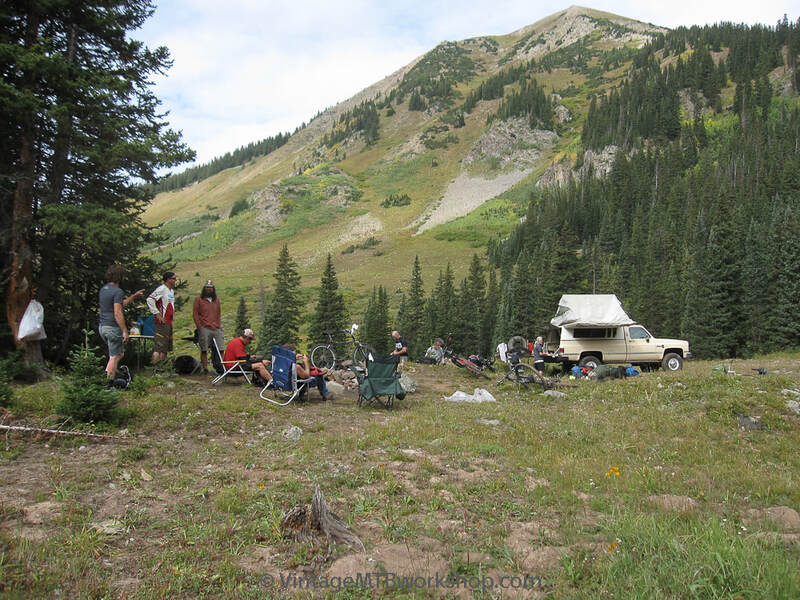 With only a small group of people this year, all of the participants decided to ride and camp out the first night in the same manner as the early years of the event. One participant graciously drove a support vehicle with the overnight and cooking supplies. 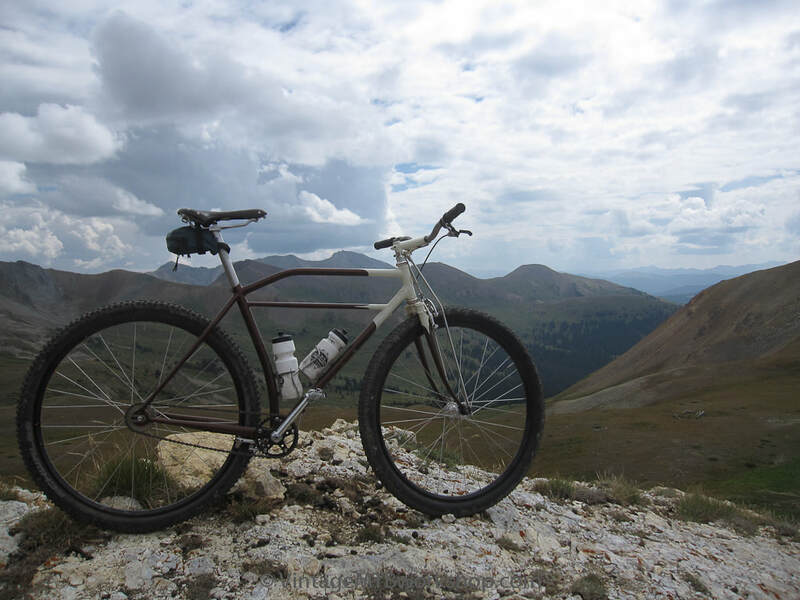 This year's ride presented a new challenge, one of negotiating a bike made at the Workshop specifically for the event in the configuration of a short wheel-base, full rigid, single speed 29er. 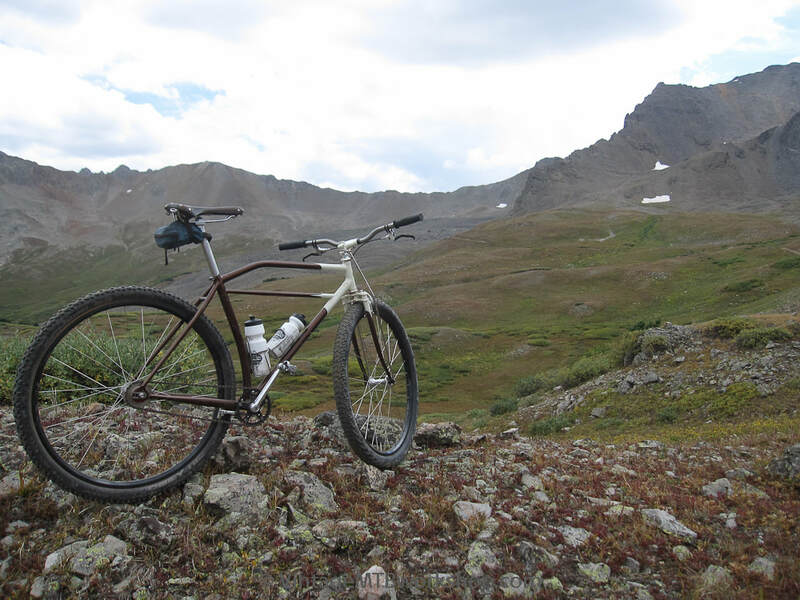 The styling of the 2017 Pearl Pass Bike is modeled after a Pierce Arrow balloon tire bike from the 1930's. 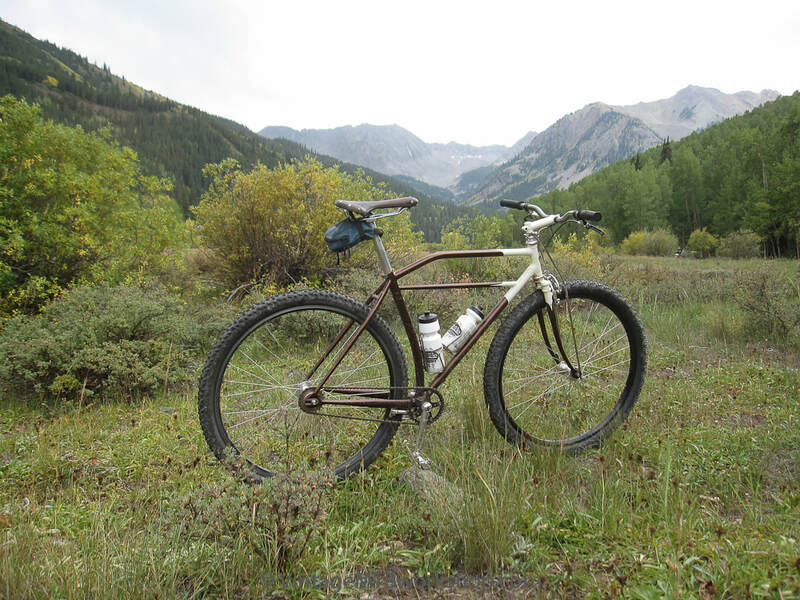 Despite the obvious limitations, the large diameter, large volume tires coupled with the short chainstays proved to be very capable on rough terrain, both going up and certainly coming down. 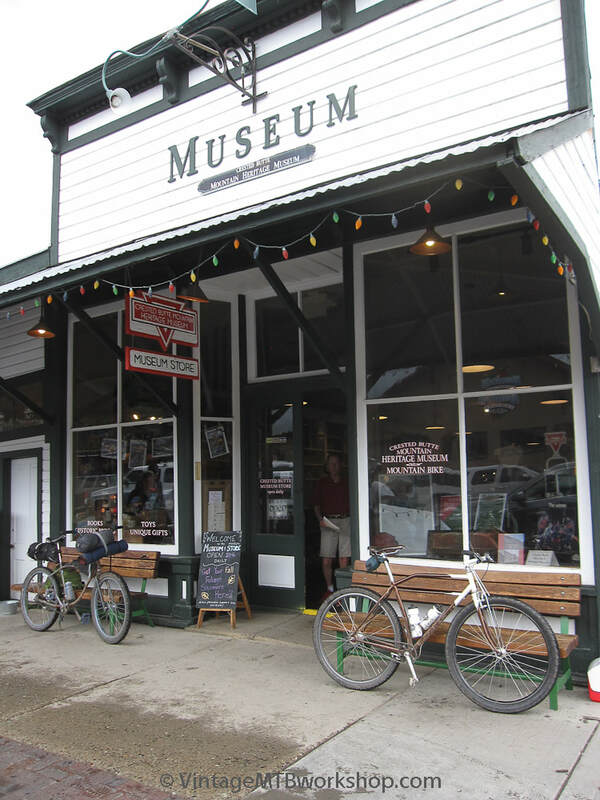 For the 2017 edition, riders started to congregate outside the Mountain Heritage Museum on Elk Avenue in Crested Butte. 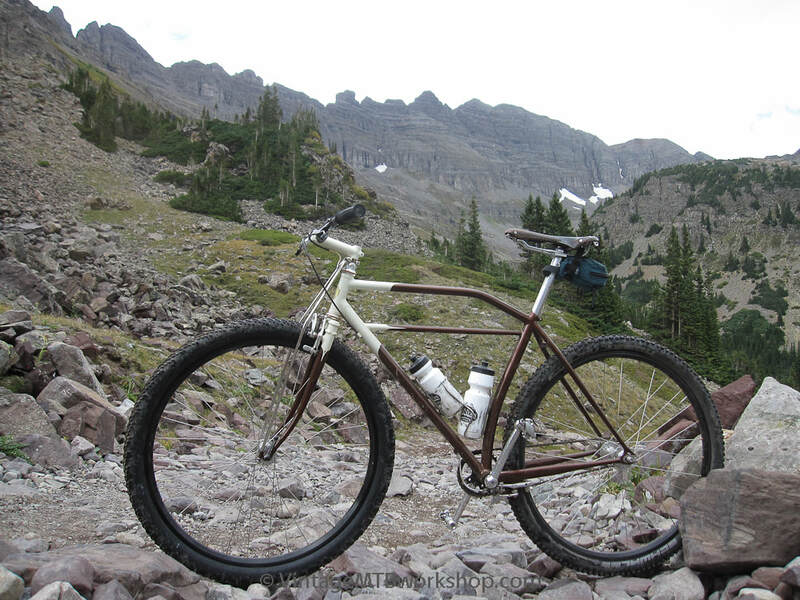 In total, three riders were on single speeds, and two of those were only running a rear coaster-brake. 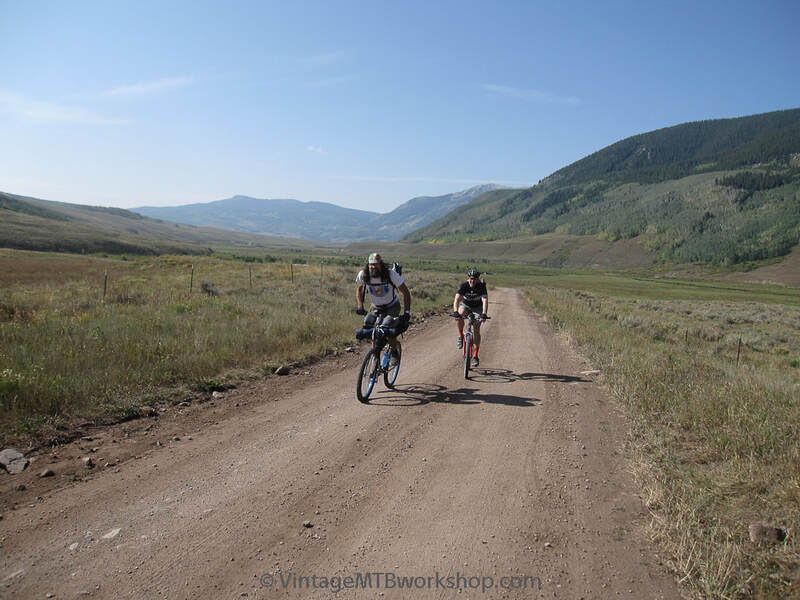 Riders heading out the Brush Creek valley with the back side of Mount Crested Butte off to the left. A view looking toward Mount Gothic in the distance. 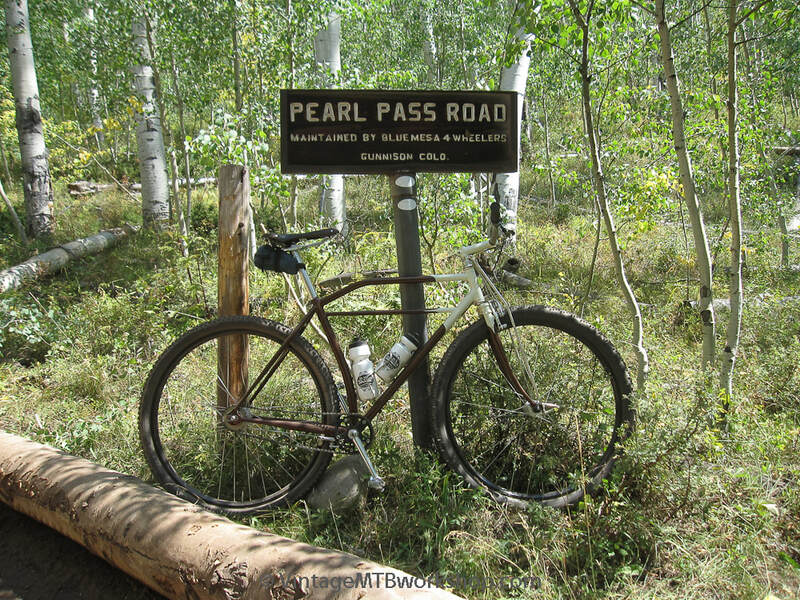 The classic sign that has endured for many decades which distinguishes the Pearl Pass Road from East Brush Creek. 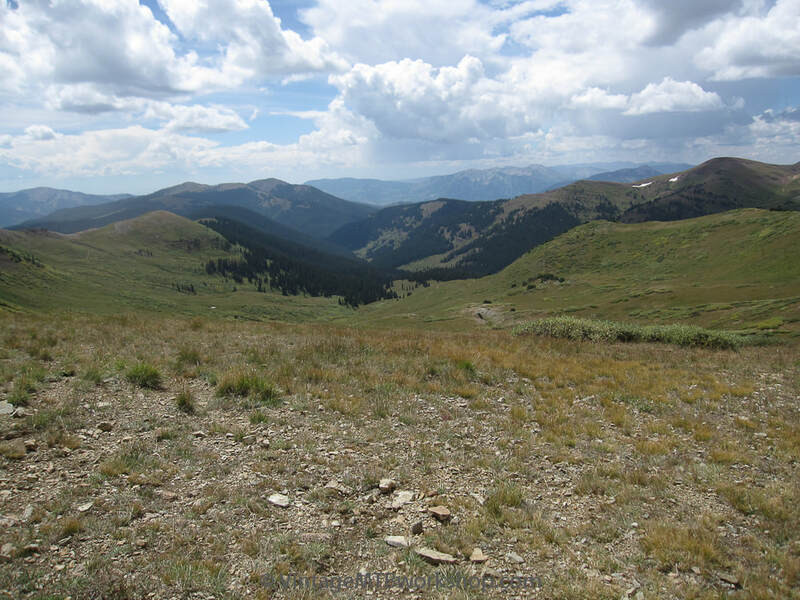 Mount Teocalli stands out in the distance, marking the first views of above-tree-line terrain. The traditional campsite at Cumberland Basin showing the potential for thunderstorms which never fully formed. The group campsite with support vehicle sporting a Wilder-Nest camping top. 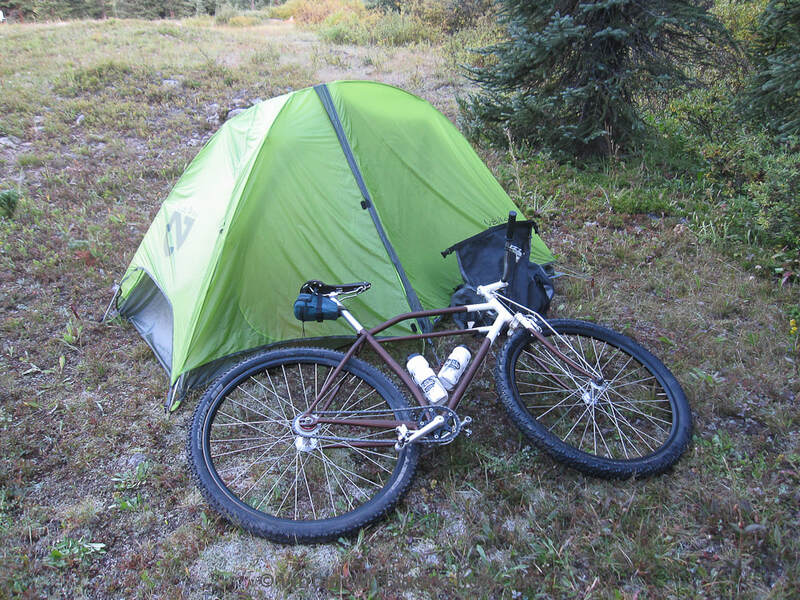 Lightweight camping with a 2 pound tent and 40 degree down sleeping bag. 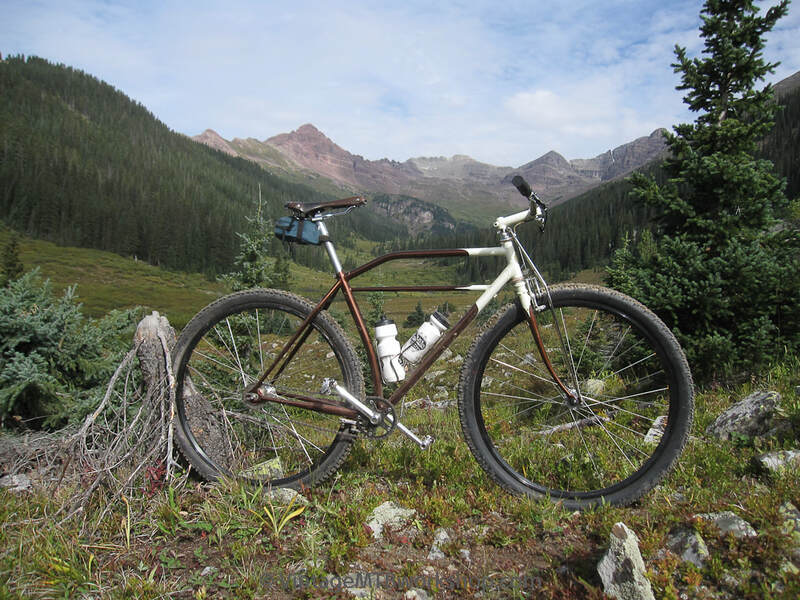 It wouldn't take too much to outfit the bike to carry everything and be self-sufficient. Perhaps next year. The spectacular views looking into the rest of Cumberland Basin, all of which is part of the East Maroon Wilderness. 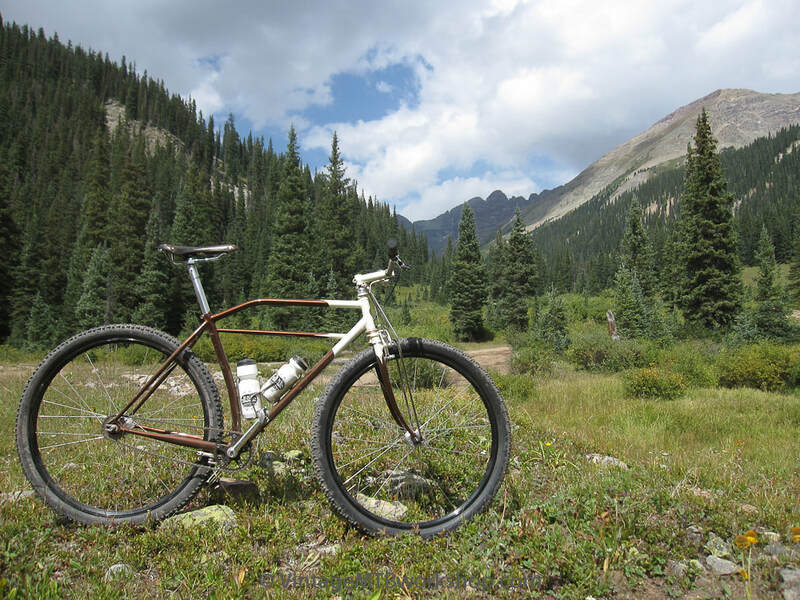 Above tree line, it's time to start pushing whether you have a single speed or many gears. 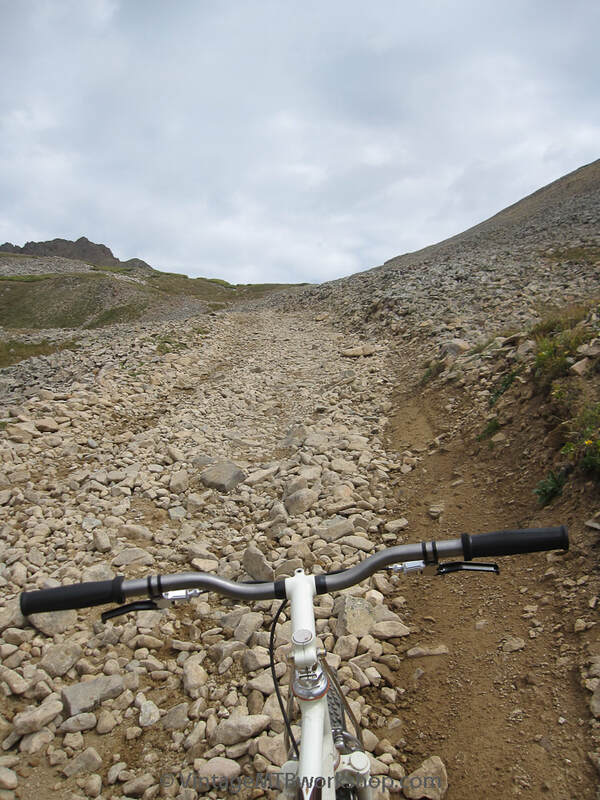 Loose, steep, and rocky, this is typical high country riding in Colorado. 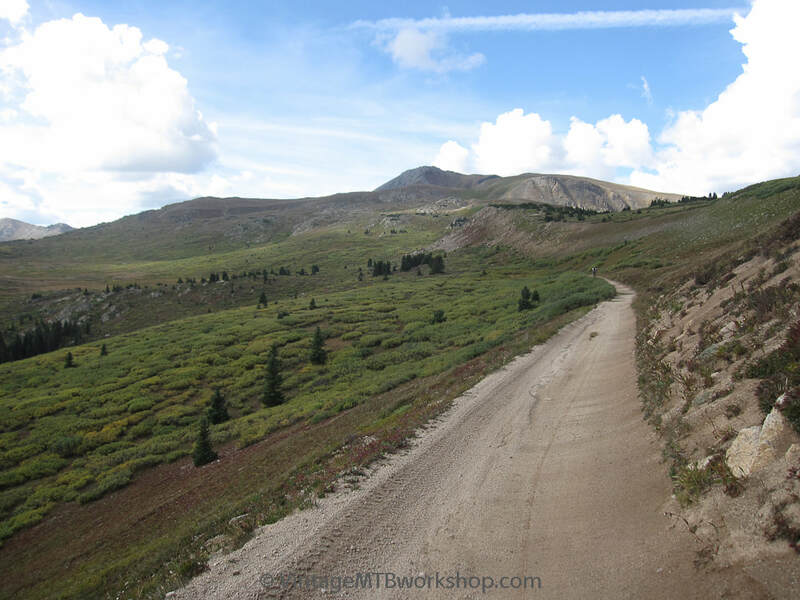 This is a jeep route after all. 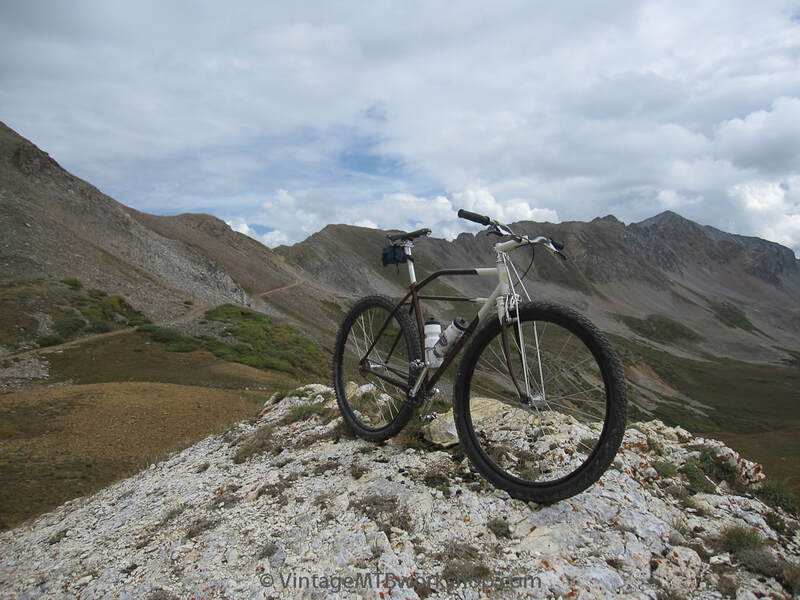 The false summit has a promontory which is perfect for a 360 bicycle photo shoot. 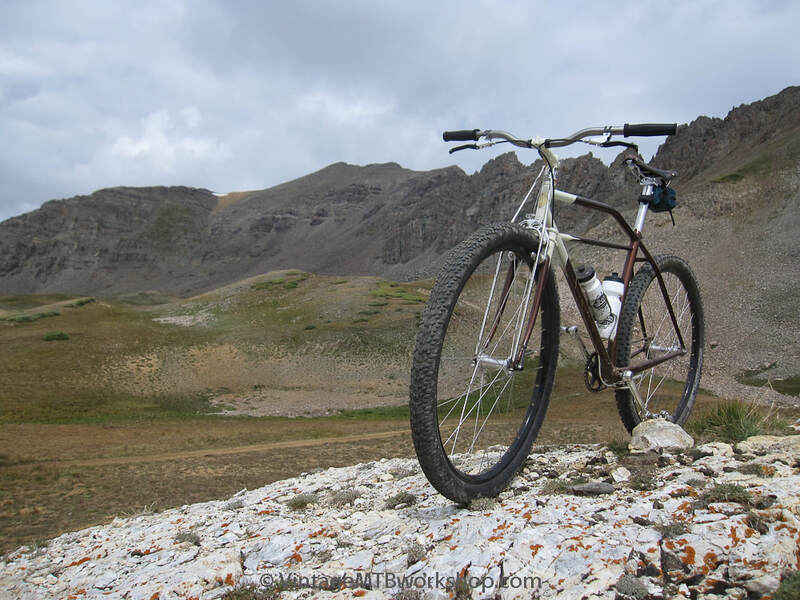 The background is pretty amazing too, including the continuation of the route up to the real summit of Pearl Pass. 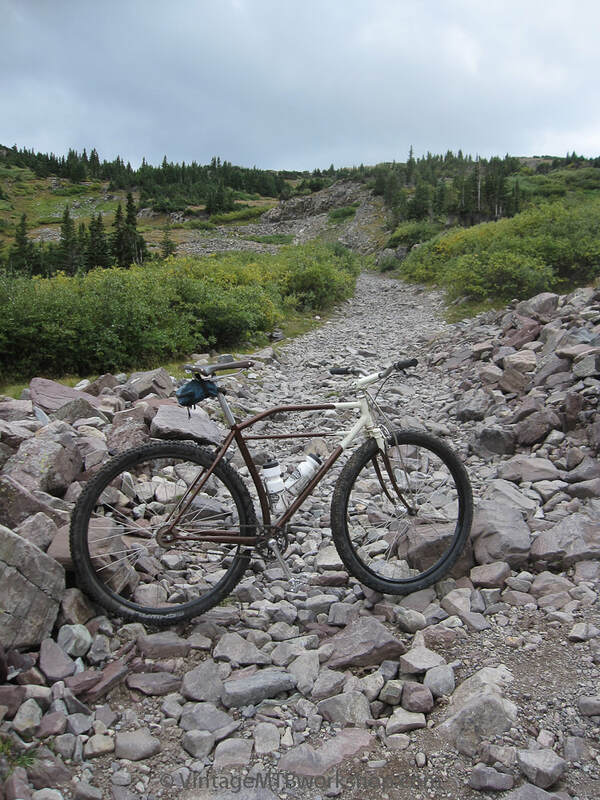 With the capabilities of this "rock star" single speed, the summit was reached with only a small bit of pushing. 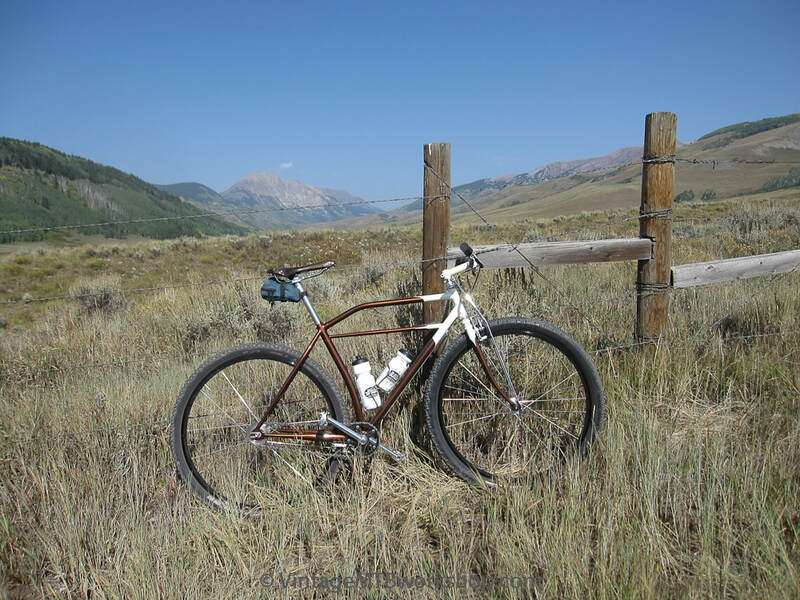 The bike proved to be just as capable as geared vintage bikes used in the past, if one allows for a few more rests between big efforts. 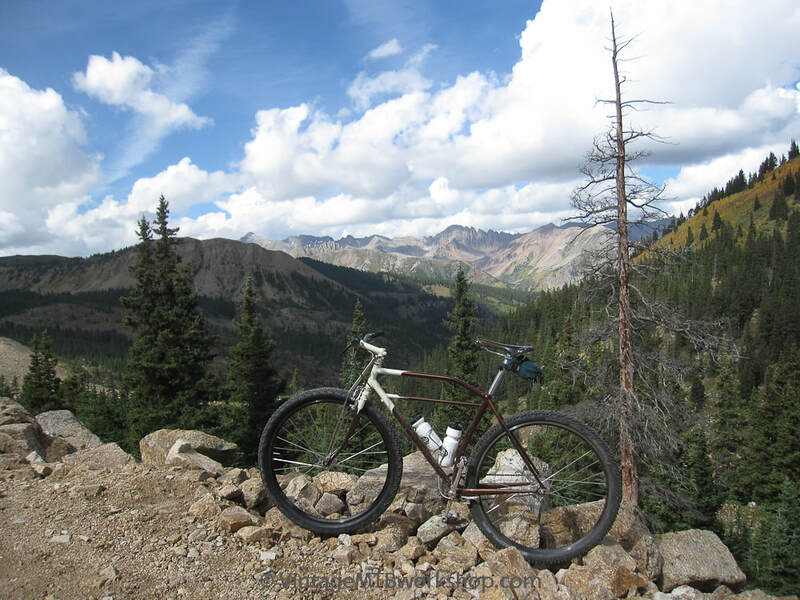 The descent down into Aspen is rough and steep, but with big wheels and tires this bike was capable of rolling all of this terrain with relative ease. Truly a "rock star." 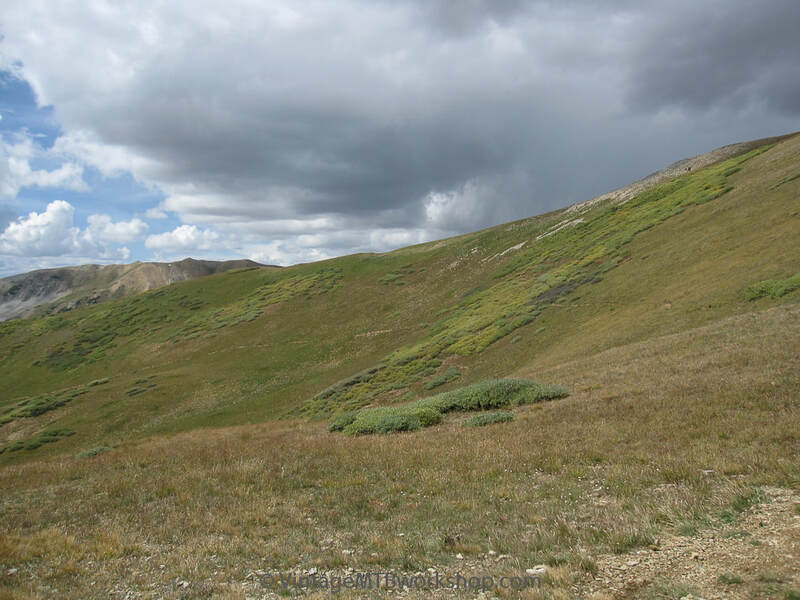 A look back at the pass in the far distance as the greenery of the above-tree-line tundra comes back into view. The time spent at this elevation is always too brief. 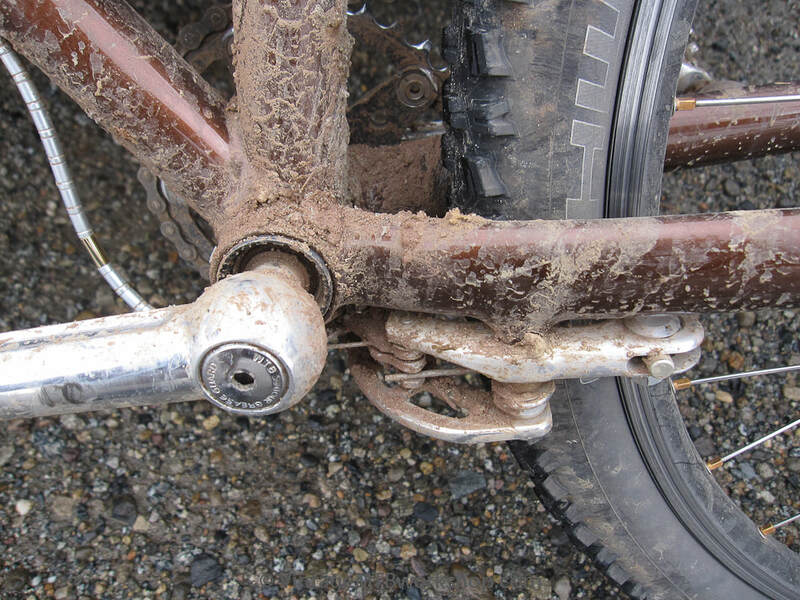 Rough but still rideable if you trust your bike. 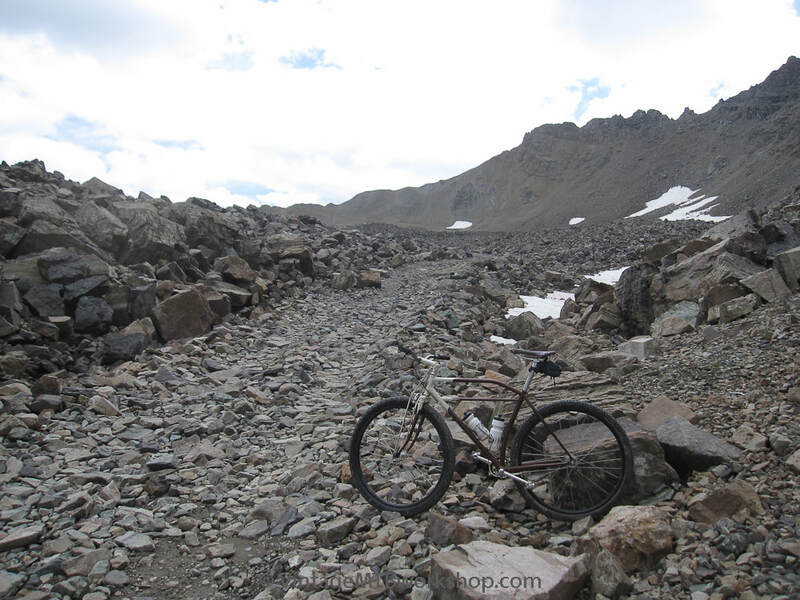 Over the years, many a prototype bike or component was tested on this terrain. One last look at Castle Peak before dipping back into the trees. The bridge that crosses the upper cascades of Castle Creek could be photographed looking into the sun this year thanks to some cloud cover. 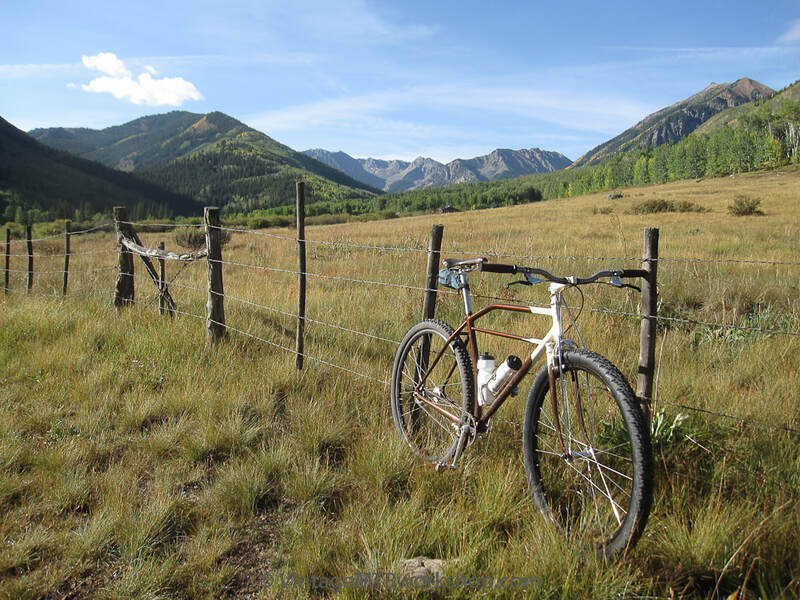 Down at the Ashcroft town site one can look back toward the mountains before beginning the final descent into Aspen. 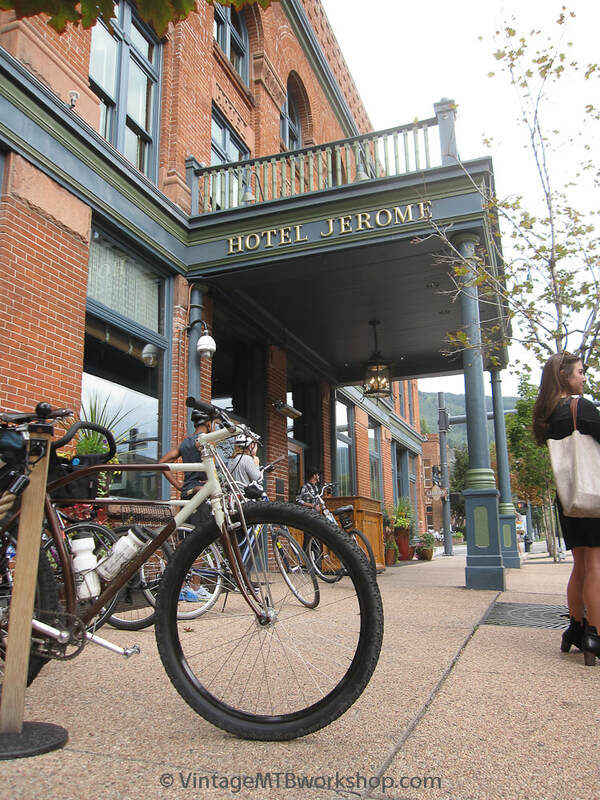 The traditional destination of the Tour is the Hotel Jerome in Aspen, where food and beverages can be had at the J-Bar. It's the perfect way to end a satisfying day. A couple of hours later the skies would open up and dump heavy rain for a solid hour. This was not the night for a camp out. 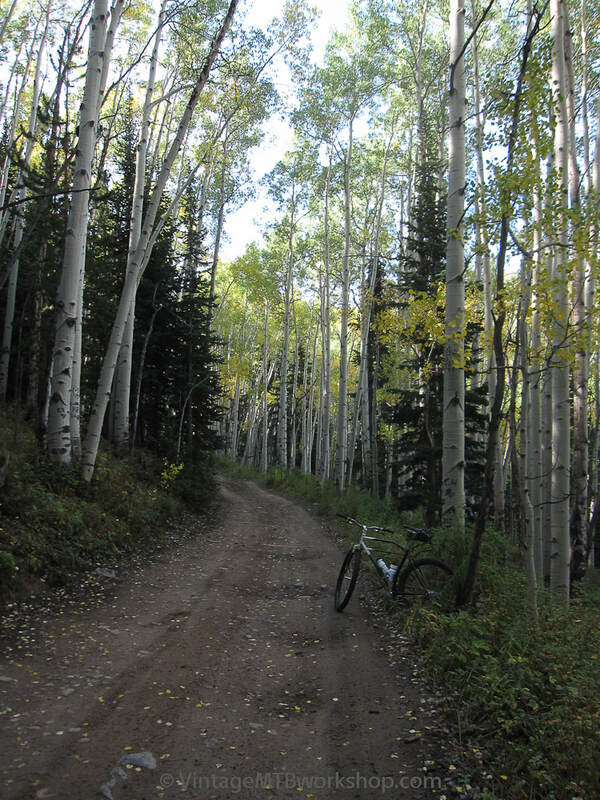 The next morning began the return ride to Crested Butte via Taylor and Star Passes, which is a much more rideable route that tops out at a lower elevation. 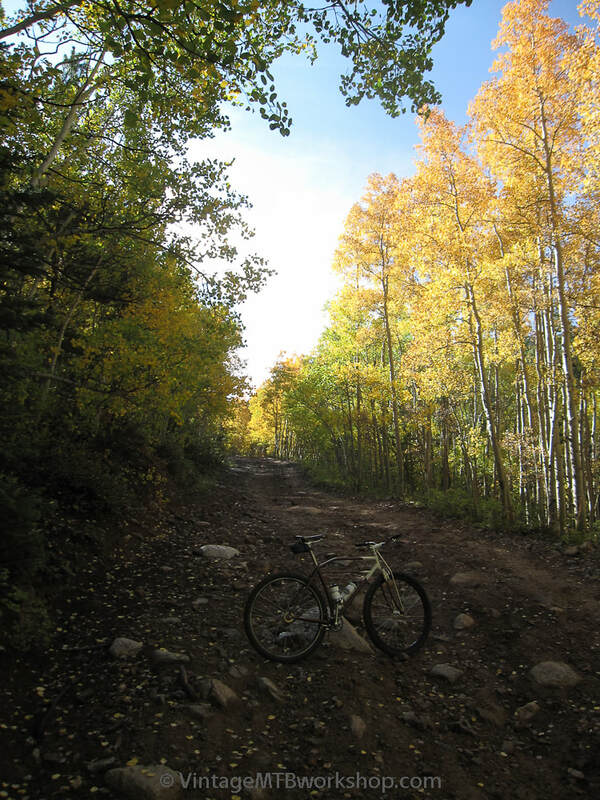 The ride up Castle Creek Road is always bathed in morning sunshine and the beginnings of fall colors. 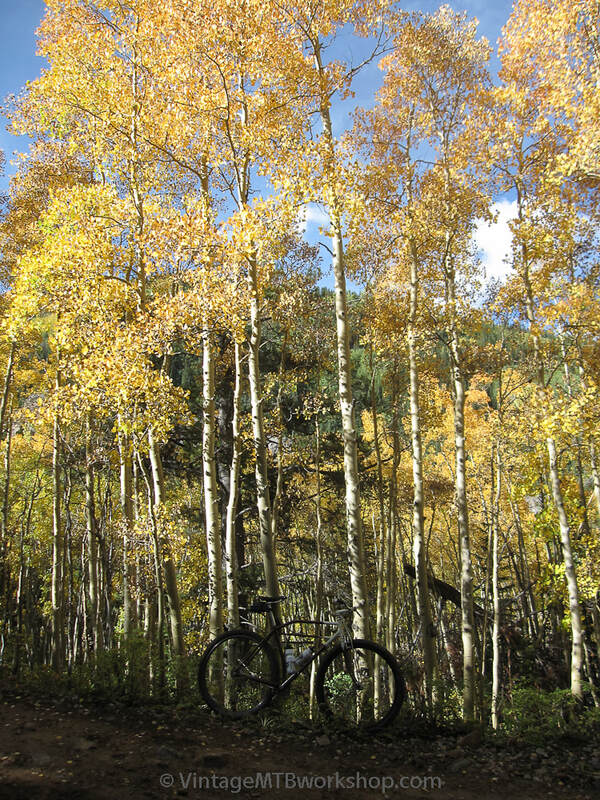 The challenging ride up Express Creek Road is made more bearable under a golden canopy. Even knowing that there are many tough miles ahead and the threat of thunderstorms later in the day, it is a joyous time. Toward the summit of Taylor Pass one gets a spectacular view of Castle Peak to the left and Cathedral Peak to the right. Because they look much bigger in real life they should be seen in person. 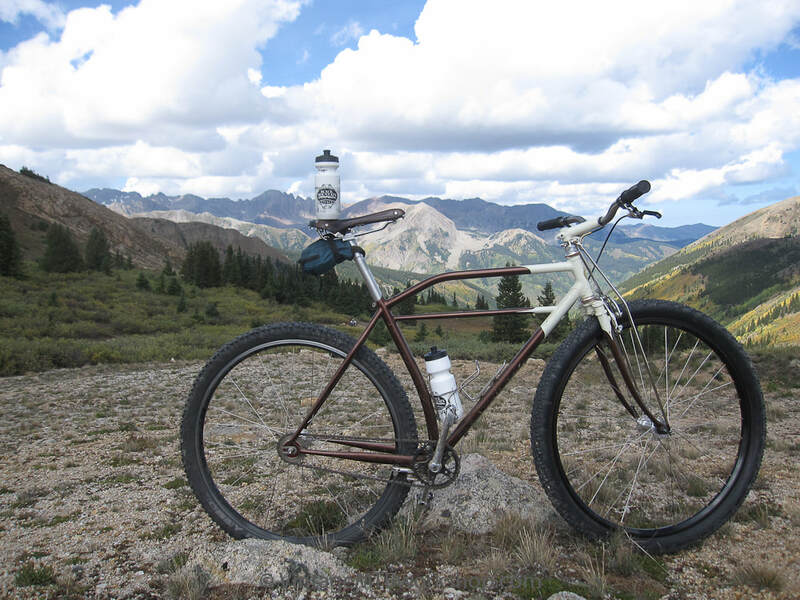 On the summit of Pearl Pass and the balancing act of a well-traveled water bottle. Over Taylor Pass one is greeted with a smooth descent. This year it was quite wet with large pools of water in each of the moguls created by motorcycle riders. It was moist, "hero dirt" this year so a nice chance to let it fly. 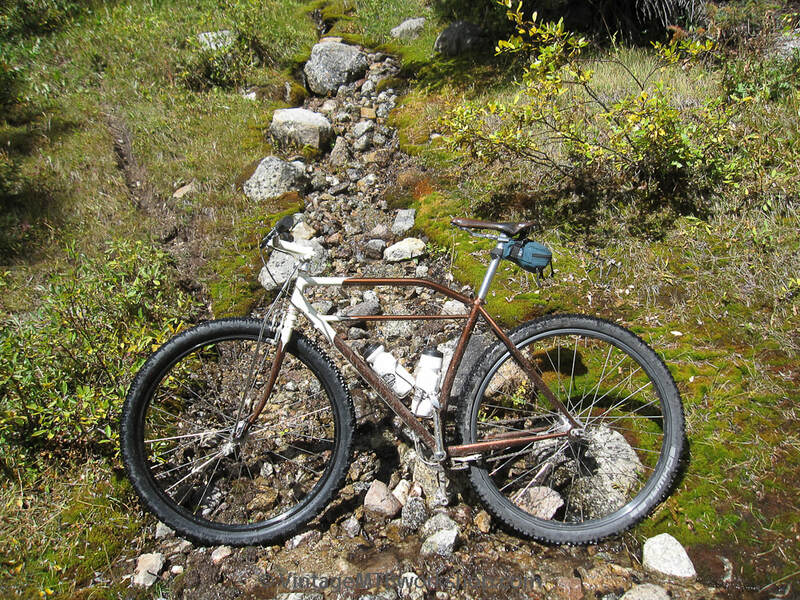 Perhaps this brown-green mountain moss was the inspiration for the paint choice. 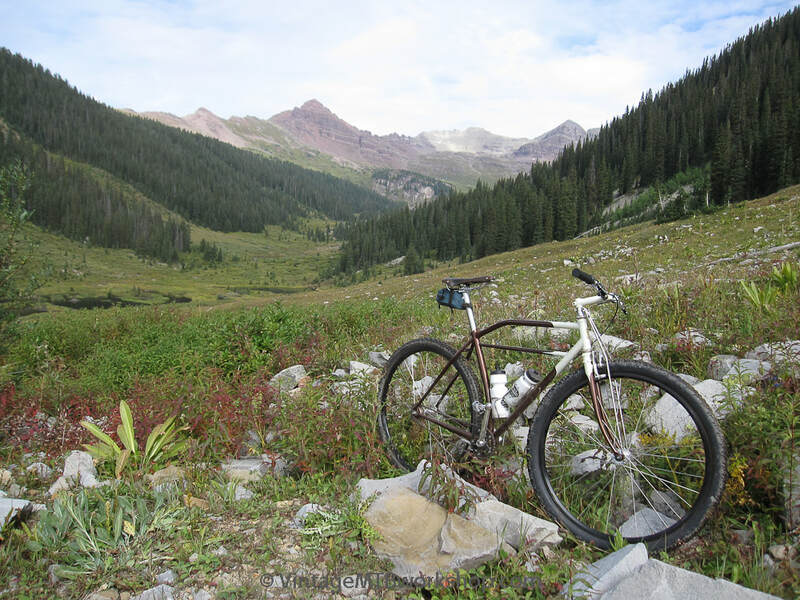 Can you find the bike in these scenes? 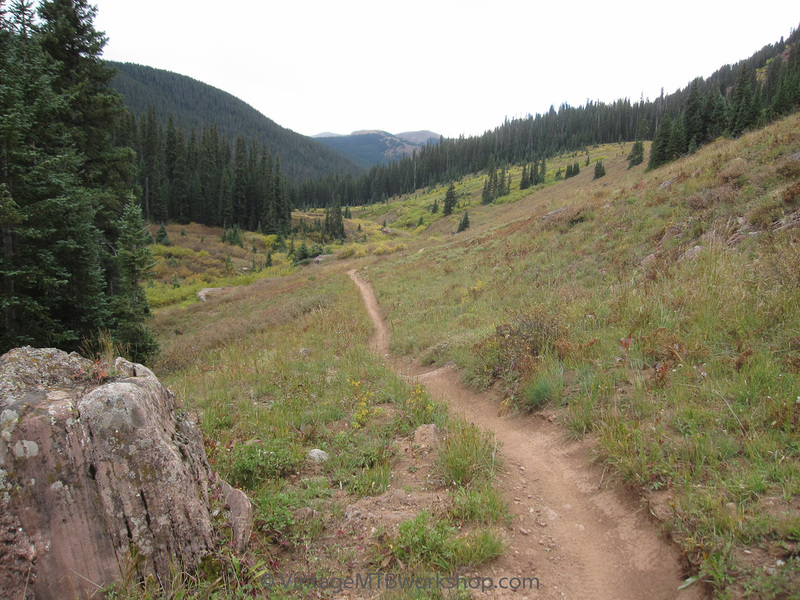 Lots of beautiful singletrack and doubletrack can be found on the traverse from Taylor to Star Pass; however, this was not some of it. Time to push. 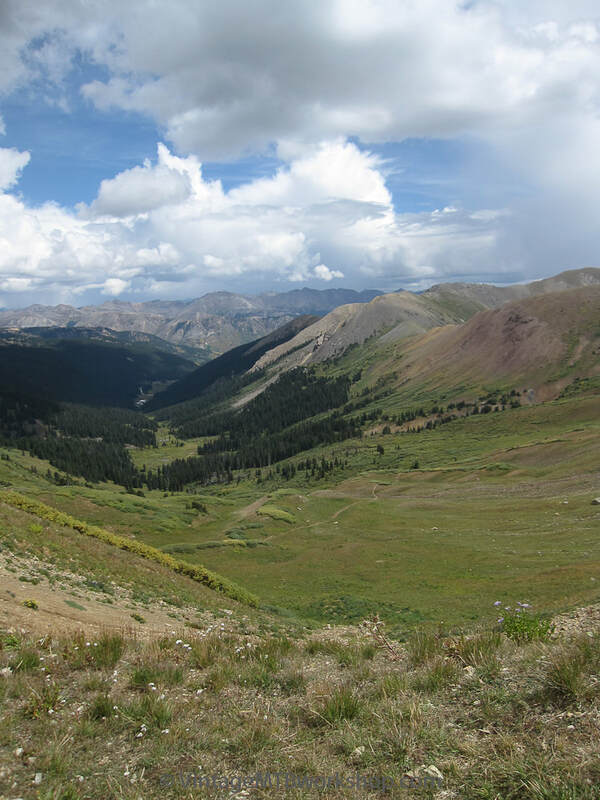 Reaching the top of Star Pass is always a huge relief, especially if there is an imminent threat of a thunderstorm. 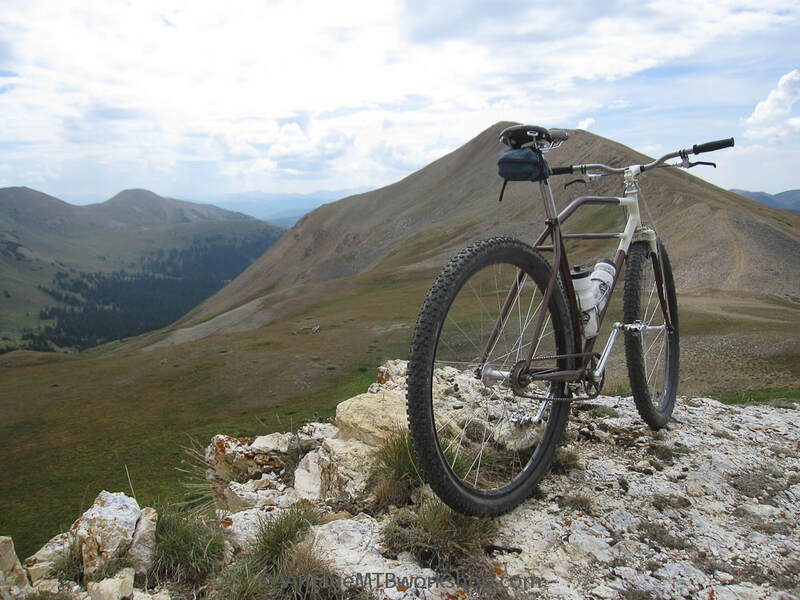 The first views of Crested Butte can be seen in the distance of the last photo. There are actually a number of ways to return from this point. 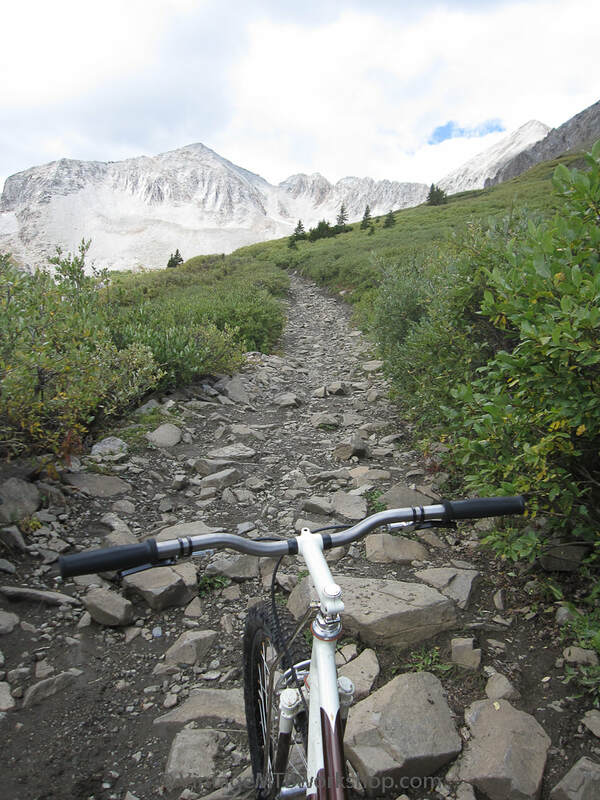 The sweet singletrack descent of East Brush Creek, trail 400. 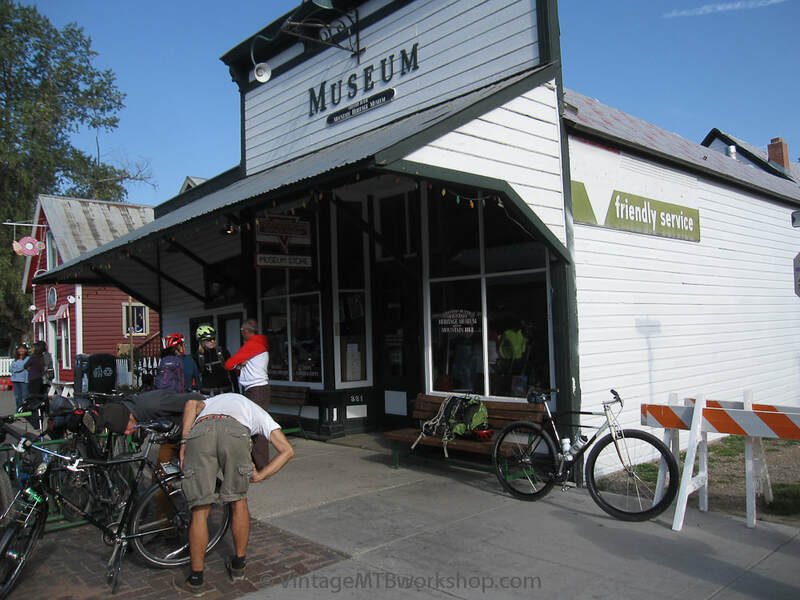 At last, a return to Crested Butte and the Mountain Heritage Museum. 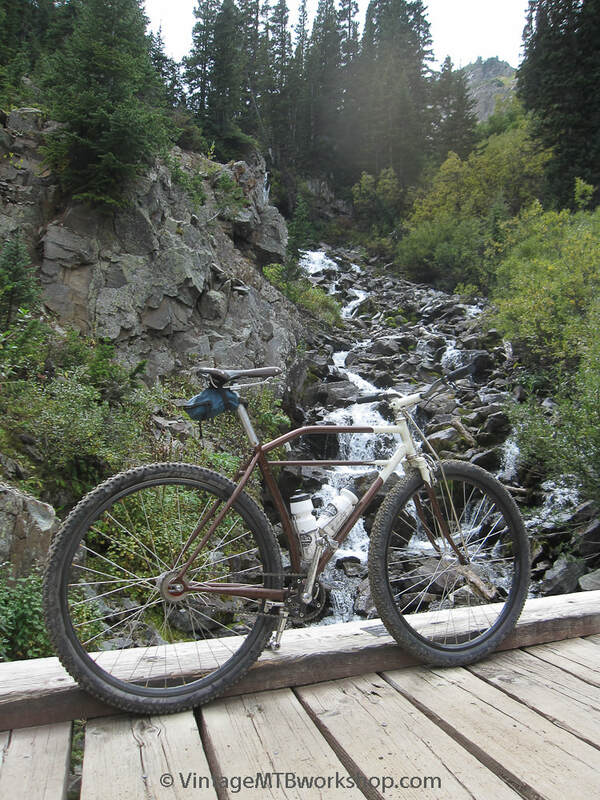 The trail conditions on the return trip were wetter than those in past years, but the bike kept rolling. 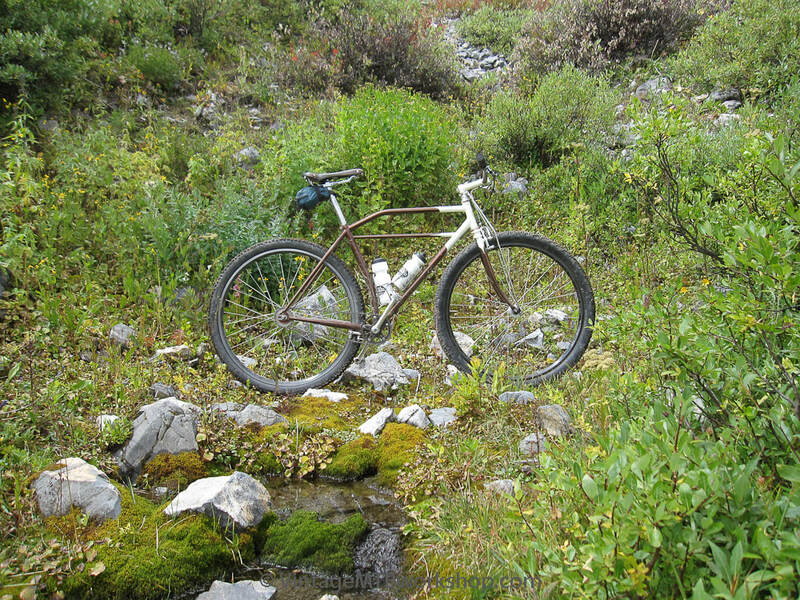 A small ding in the downtube, some paint worn off here and there, but the bike survived. 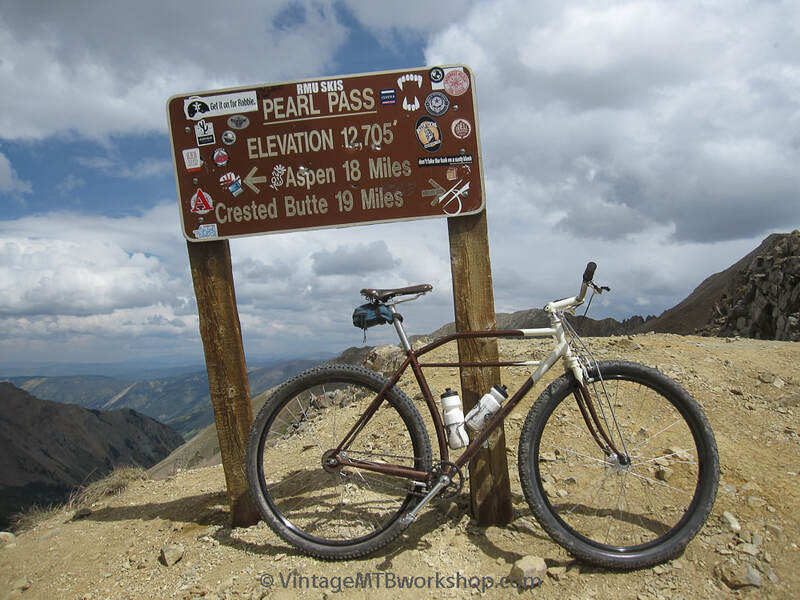 As has been true for many decades before, Pearl Pass provided to be a good testing ground for both man and machine.